“They would have put the fence up higher if we weren’t supposed to pet them,” Moritz rationalized, reaching down to stroke his newfound soulbird. I prayed that it would bite him (Moritz, not the chick). 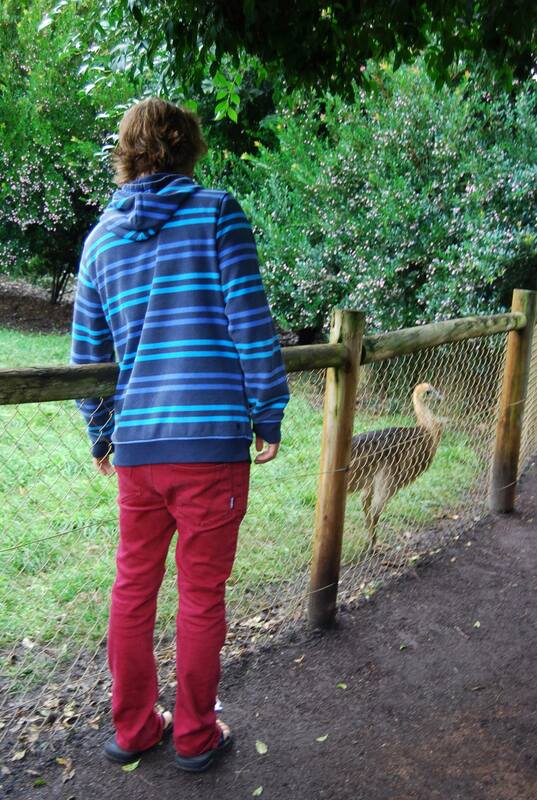 The baby emu darted his head away suspiciously. Was there drama in wildlife paradise already? 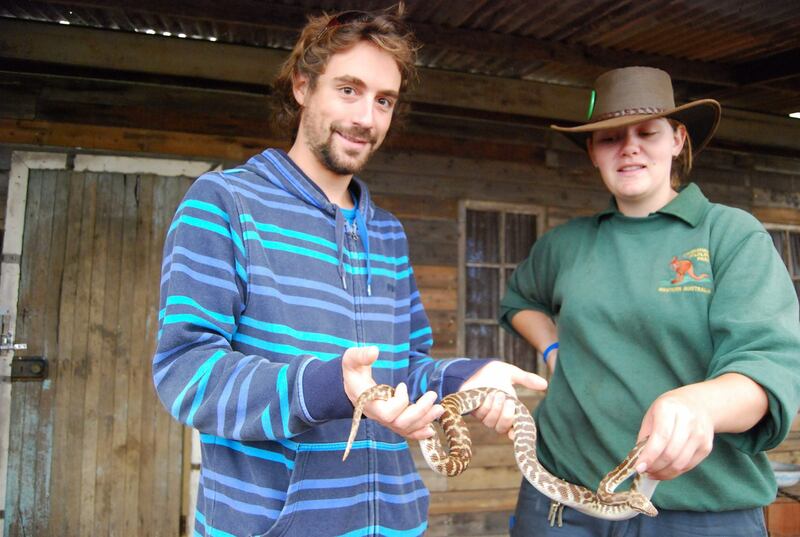 The park is a free reign do-your-own-wilderness-experience with a few animal shows in between. Even those are pretty simplified, with the host starting with, “Hi! I’m Jim, an animal ambassador. 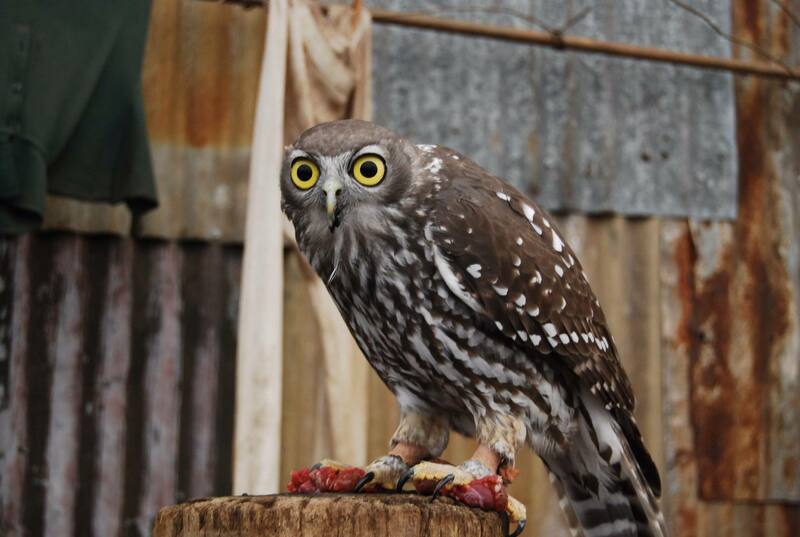 I know you guys came to see the animals and not hear me speak, so here you go.” Ten other animal ambassadors proceeded to come out with a plethora of awesome amphibians, birds, and marsupials! 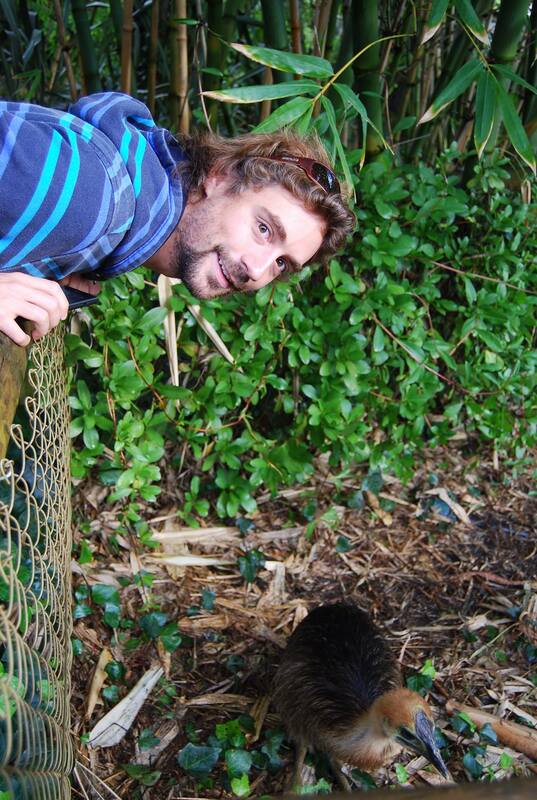 Apparently wombats are very playful! However, the wombat we saw was under what seemed to be a food induced coma — I know this because I resume the same posture and expression after a long night spent at Souplantation’s buffet tables. The wombat ended up being Moritz’s favorite animal we saw that day (yeah, baby emu was a short term relationship he assured me). An interesting turn of events considering I played The Wombats in the car on the way over in hopes of inspiring the spirit of the wild and he turned it off. 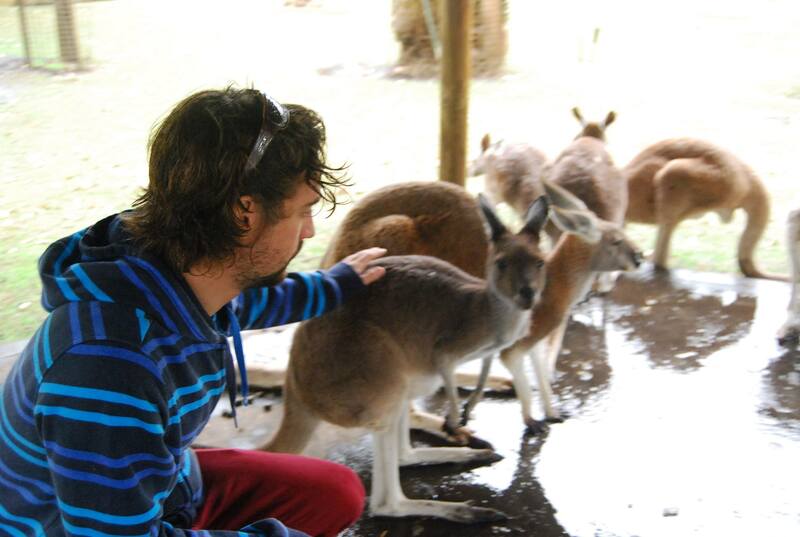 Our encounters with kangaroos in Kalbarri and Albany had fostered an attachment between these marsupials and I. 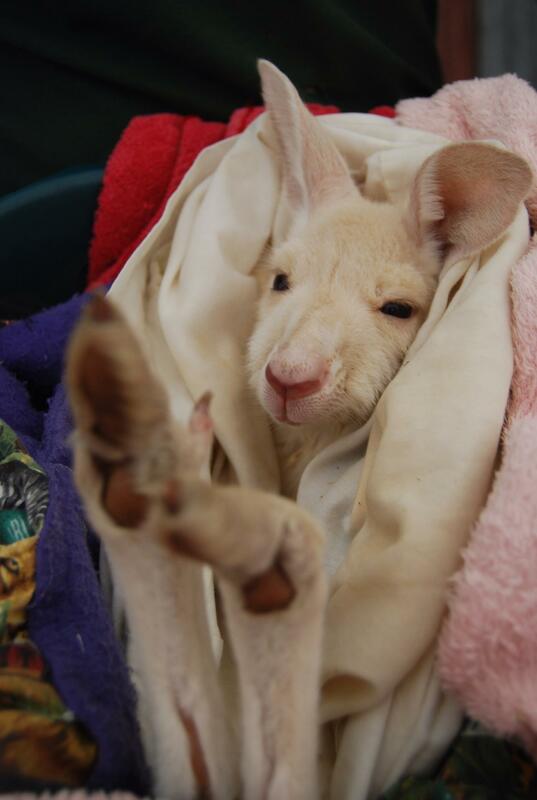 One of the animal handlers brought out an orphaned joey who loved having her feet tickled and stayed nestled in her faux pouch made of soft blankets. We visited a joey nursery just before a downpour started before migrating to the koalas. 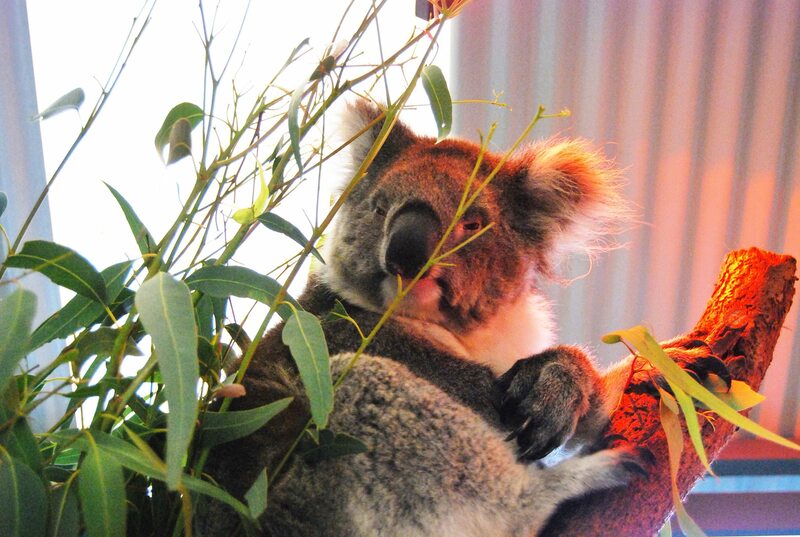 The koalas were just doing what they always do – sleeping, because they sleep 20 hours a day! 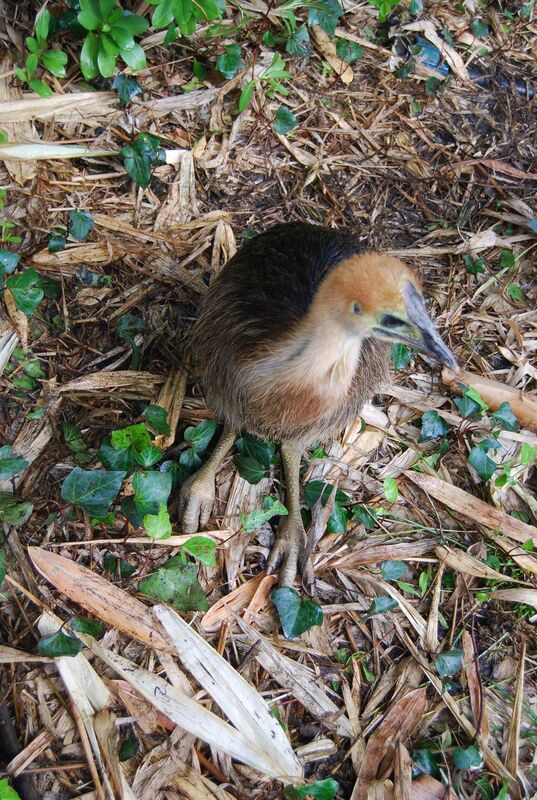 However, I have a hard time grappling with whether the ones here are more well rested than the ones in the wild. Sure, life on the open eucalyptus forest requires more survival skills, but are the constant camera flashes and tugs on the fur by onery children that much more peaceful? By the looks of this koala, I was convinced that if I were to become reincarnated as a koala, please diety, let me avoid captivity! 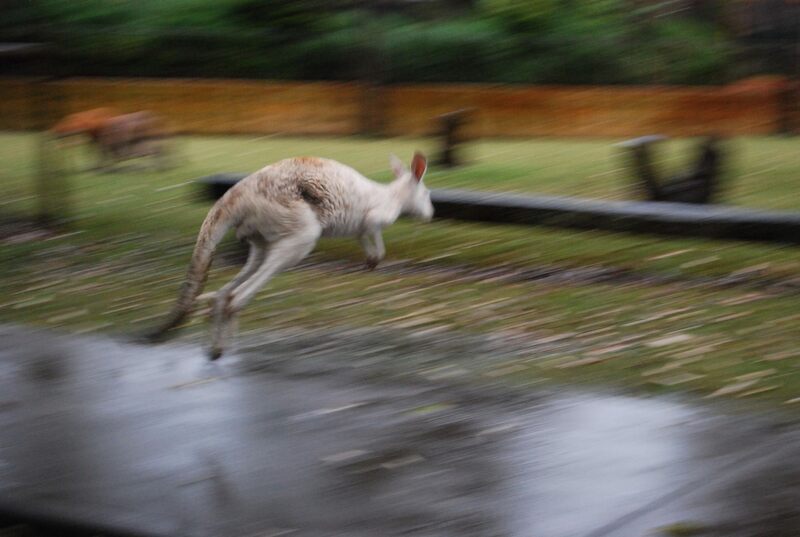 The rain was pouring, and kangaroos were boinging amuck. 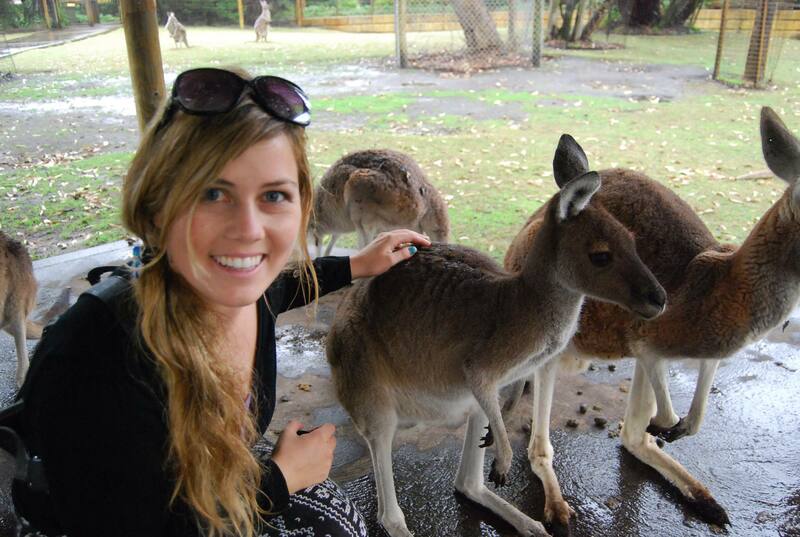 We were able to go into a petting area and actually PLAY with the kangaroos. I almost cried (literally) of excitement! 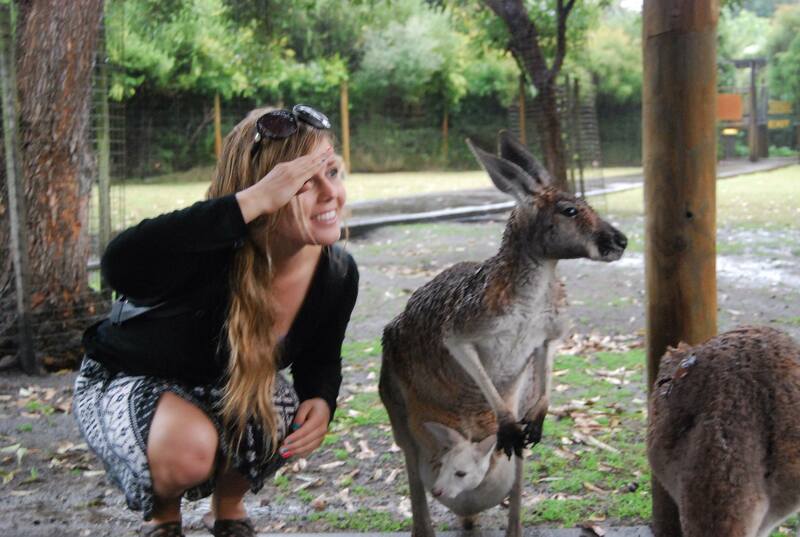 It seems as though Kangaroos are to Australia as goats are to America. You can pet goats, but it’s never really very satisfying. 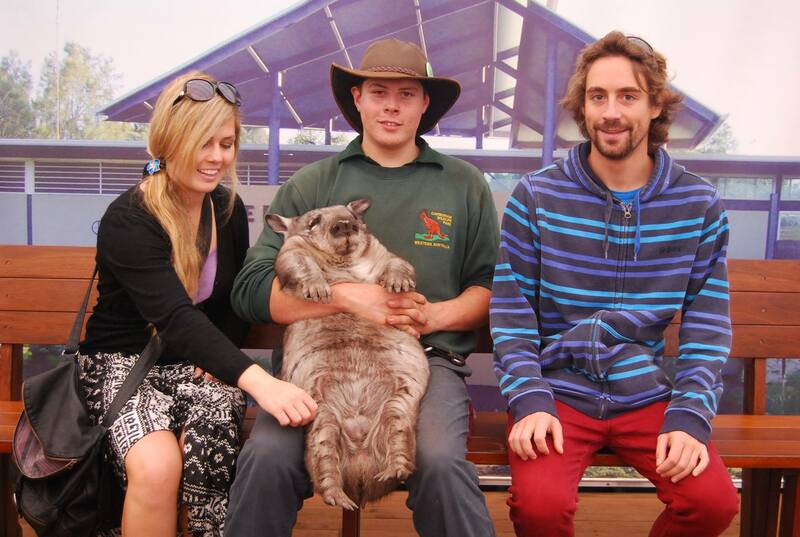 Kangaroos, on the other hand, are very satisfying. They’re softer, cuter, and they can bounce! I loved seeing the joeys snuggled in their mother’s pouches. Wallabies and peacocks were in the area as well, but they kept their distance. They shook paws with us and sniffed us for food. 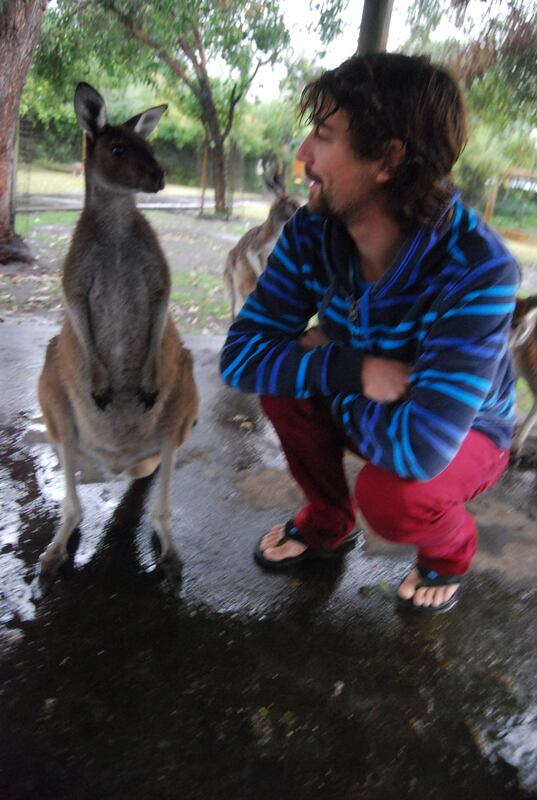 One of the kangaroos, Joseph, followed us around faithfully. He quickly became my favorite of the mob. The day’s rain was a blessing in disguise because it kept the kangaroos huddled together under the only sheltered area, and the crowd stayed away. 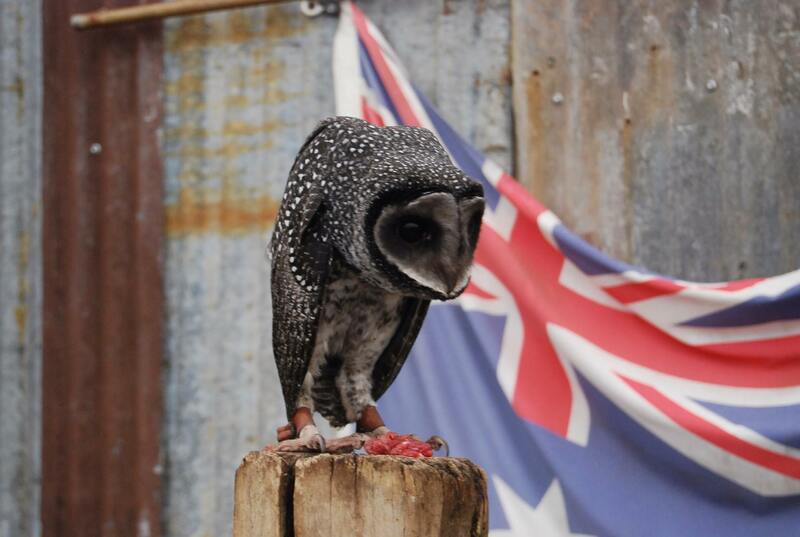 We walked through puddles back to our car and gossiped about all of the critters we met that day, barely acknowledging that we were approaching my final hours in Australia. to conversation and may more things in australia i like most.